Ayesha Farha Chowdhury was born in 1980. She obtained her master’s degree in MBA from National University of Chittagong. In personal life she is married. She is the mother of 1 (One) Child. Her husband Mr. Fahim Ahmed Faruk Chowdhury is a renowned businessman in Bangladesh. She is a self-groomed business women as well as the visualizer of her concern. She started her initial business from the year 2007. 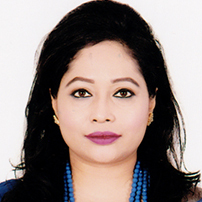 She is a successful business entrepreneur in Chittagong Bangladesh running business with a particular emphasis on dedicated services involved in Importing, Manufacturing, Property Development and Real Estate business. Her company CEM Ready Mix Concrete Ltd. – is a well known manufacturer and supplier of ready mix concrete that are mixed in accurate composition for building construction. She embarked her entrepreneurial carrier in 2009 by starting business successfully. She managed and ran, gaining experience and acclaim as an innovative business women. She also established FAC Holdings Limited, Eastern Enterprise Limited & FAC Electric Manufacturing Company Limited in the year 2009. She continued business being engaged in different important sectors as decision making to expand her family business as the sole owner. In 2012 She started a new entrepreneurial endeavor of Ready Mix Concrete as the Chairman- of CEM Ready Mix Concrete Limited to fulfill the market gap of infrastructural and construction industry. The total turnover of this business is run by 2250+ management and non-management staffs working at CEM Ready Mix Concrete Limited. In 2015 She launched another new project as product-UPVC (unplasticized polyvinyl chloride) as the Chairman of CEM UPVC Limited for UPVC Window & Doors which is better than Aluminum. CEM UPVC Ltd. products are imported from China, Thailand, Indonesia, Malaysia & India which is being assembled in the factory located in Chittagong, Bangladesh. At the initial level we are making Doors and Windows and have a plan to make furniture by using UPVC. She have an interest to develop Home Décor and Interior business to create a new milestone in the business area of Chittagong. She intend to establish more new branches for UPVC factory where they can be able to produce UPVC products in future. She anticipates establishing Poly Concrete Plant which will create scope for concreting the roof that helps to decrease heat. It will be the first Poly Concrete Factory in Chittagong. She also have an interest to develop Home Decor factory. This factory will facilitate and emphasis women engagement which would be a good step for women empowerment. She is also one of the distinguished Director of Chittagong Women Chamber of Commerce & Industry. Presently, she successfully maintains 05 business projects. She is a renowned and successful business woman in Chittagong as well as member of various social organizations in Chittagong Bangladesh. She has also visited and participates in many trade fairs and business meeting locally and internationally. Recently she has been awarded for the prestigious International Women’s Entrepreneur Challenge Awards(IWEC)-2017 achievement award at New York USA.. She has been also awarded as best and foremost importer of the country related to Import & Export from the Ministry of Commerce & Industry Govt. of the Peoples Republic of Bangladesh for her active performance. She is a member of The Federation of Bangladesh Chambers of Commerce & Industry(FBCCI) and also one of the distinguished Director of Chittagong Women Chamber of Commerce & Industry. As a female business owner, it can be a challenging and daunting task to get others to value my business ideas and respect my contributions.